Yes, the Mariners signed Jeremy Bonderman to a minor league contract with a spring training invite. No, it's nothing to get emotional about in any way shape or form. Seeing as how it's the weekend before Christmas and the odds that there will be any moves worthy of significance is slim, so we get to think about Jeremy Bonderman for a day or two. ...Bonderman is coming off of Tommy John surgery last April and the Mariners are signing him blind. He hasn't thrown since then, but is still rehabbing in an attempt to make a comeback. Expecting anything except mediocrity from Bonderman would be overly optimistic, but even so, there's no risk. If he makes the team, he can eat up innings and cost Seattle a bucket of cut grass. If he doesn't, he'll pitch for Tacoma as an option in case any of the pitchers that make the club go down for some reason. Even before his surgery, Bonderman wasn't exactly tearing up the league with his arsenal of knee buckling pitches. Most players whose knees buckled at the sight of his pitches fell, in part, because of the hilarity of it. His best season was 2006 when he had an ERA just over four and over 200 innings pitched. He started his career in 2003, last pitched in 2010 and with the exception of 2006, has never had an ERA under 4.5 and thrown more than 200 innings. He had an ERA of 4.29 in 2008 in 12 starts before his arm exploded, but just over a third of a season doesn't qualify. Even if he is able to pitch when the Mariners start spring training, Bonderman's command is going to be pretty much non-existent. If there's one thing that players coming back from TJ surgery have taught us, it's that it takes at least one full season under his belt to get back on track. With Bonderman walking near the track and glancing behind him to make sure a train isn't coming even when he was healthy, getting the ball over the plate on a fairly consistent basis is probably where you want to place your expectations. It's a minor signing in case whatever plan the front office has for the rotation hits a snag. This isn't a move in response to trading Jason Vargas because realistically, you're expecting Bonderman to spend most of the season in the minors. At least, I think that's how it works. With the new CBA, it's possible that, come June 1st, if he's not with the big league club by then, he can opt out and become a free agent. I should look into that, but come on, its Jeremy Bonderman. In essence, the Mariners signed Bonderman blind, not knowing what they're going to get, and that's just fine. He costs nothing and its a minor league deal. Considering what the going rate has been this offseason for even fringe starters, it's not a bad signing by the Mariners. We all still want at least another bat, but not all the free agent signings can make some kind of a splash. This one is more of a "Let's see what happens" type of deal and sometimes, they work out. I'm not getting my hopes up on this one, but at least they didn't sign Blanton for 2/$15m. Bonderman is a stopgap/insurance policy for the big league club that might actually turn in to something, so sure, why not? 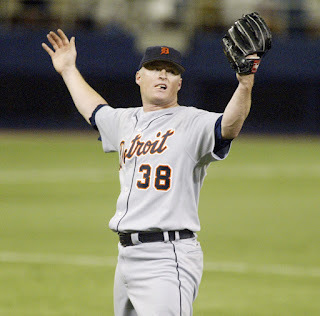 Also of note, Jeremy Bonderman is from Pasco, Washington. Travis Buck is from Richland, Washington. Hope Solo is from Richland, Washington. So hey, at least the Tri-Cities in eastern Washington can claim they have produced grapes. For wine and the like. Because those three, I'm not sure I'd lay claim to that. And sagebrush. We also have a lot of sagebrush. A LOT of sagebrush.